The lounging comfort of a recliner is even better when it's combined with the versatility of a sofa. Double reclining sofas allow you to be close to loved ones without compromising comfort. From traditional to modern, you should be able to find a sofa to complement your décor. Before you begin shopping for your perfect sofa, it will help to narrow your choices. The best way is to decide which style will best fit into your existing interior design. A sofa with finishing details, such as tufting with buttons, nailhead trim or wood trim is a great traditional look. For a modern style, opt for a sofa with clean lines and minimal detailing. If comfort is your top priority, select a sofa with pillow arms to cushion your family in true luxury. The dual recliner sofa looks like a regular couch with three seat sections, but has a recliner section anchored on either end of the sofa. These recliners can either be manual or power operated, depending on the manufacturer offerings. Amazon features Homelegance's Cranley Collection Double Reclining Sofa in black bonded leather. Arms, seats and backs are overstuffed with high-density foam. The sides of the sofa are upholstered in faux leather. The back is 40"H and the sofa features lever action mechanisms for reclining. Pros/Cons: The sofa isn't all leather, but high density foam means the sofa padding will retain its resilience longer. Reviews: One Amazon customer has owned this sofa for 11 years and is still happy with it. Another customer reports owning a sofa for 10 years and it is still in good condition. Customers comment that the sofa is very comfortable. La-Z-Boy® presents the Rex La-Z-Time® full reclining sofa featuring a pub-style back with pillow top arms. The sofa is available in fabric upholstery only. 40"H back. Pros/Cons: La-Z-Boy customers attest to quality and longevity, but this sofa may not have high enough back for taller customers. Reviews: One customer comments they've had the sofa for 20 years and it still works well, and just beginning to show wear. Another customer comments that it is more comfortable than a bed. Dual reclining loveseats are like a mini-sofa. Unlike a three-seat sofa, a double-seat loveseat allows for greater intimacy for two people. This style is an excellent choice for small rooms, especially apartment living or part of a group setting in a larger room. 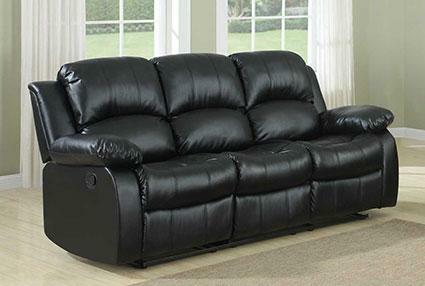 Wayfair offers the Wildon Home ® Wickenburg Reclining Loveseat that's constructed from bonded leather with pillow arms. Pros/Cons: The back is 39"H and may be too short for taller customers. Bonded leather is a man-made upholstery material created from leather scraps bonded together and is a cheaper priced leather choice. The polyurethane coating is embossed with a leather grain texture. Reviews: Wayfair customers generally report being pleased with their purchase, but one customer reports difficulty getting the chair down from the reclining position and another reports that the left side recliner appeared jammed. La-Z-Boy® offers the Joshua Reclina-Way® Full Reclining Loveseat. The sofa features double chaise seats, a tiered cushion back and pillow arms. You can choose from custom fabrics or a single-needle topstitch leather covering. Pros/Cons: The 42.5" height is a little more than the average sofa/recliner and good for taller people, but may offer too much height for customers of average height or less. Reviews: La-Z-Boy Customers report being pleased with performance, comfort and fabric look and wear. 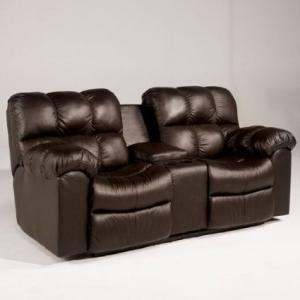 The loveseat recliner featuring a middle console is a popular choice for television fans. The ability to sit close to your mate while enjoying a movie or TV show is greatly improved with the convenience a middle console offers. Most consoles have a flip-top storage area for the remote control. Famous Brand Furniture- Famous Collection is a favorite choice found on Amazon. 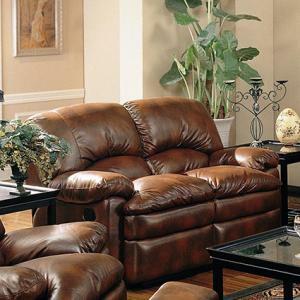 This double-reclining loveseat comes in a chocolate leather match upholstery featuring a middle flip-top console and two-cup holder. Pros/Cons: The back is 40"H and provides enough support for average height customers and some taller customers. Leather match is the practice of placing top-grain leather upholstery everywhere you touch, such as seats, leg rests, arms and back rest. The sides and back may be bonded leather, split leather or even a vinyl. Reviews: Amazon Customers report that the loveseat is sturdy and comfortable. One reviewer sleeps on it. La-Z-Boy makes it cozy with the Lancer La-Z-Time® Full Reclining Loveseat featuring a middle console with a flip-top storage and two cup holders. A comfortable chaise seat and pillow-padded arms give extra support and luxury. Pros/Cons: If you're tall, the 43.5" height will appeal to you but if you are average or smaller height, this loveseat back may prove too high. Reviews: Overall, La-Z-Boy customers are pleased with their purchase. Most customers opted for power recliner mechanism. One reviewer commented that the power mechanism was sometimes noisy. For larger living rooms, you might choose a double recliner sectional. These units are typically L-shaped and can be often be custom designed by section. 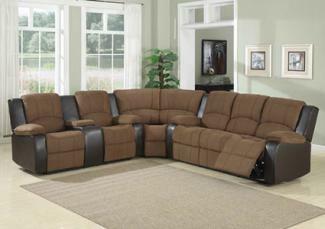 Double recliner sectional sofas fit easily into corners or can be freestanding in a large space. Wayfair features the AC Pacific Peter Dual Reclining Sectional in a home theater configuration. The sectional is upholstered in suede and faux leather with generous padding. There are two-double recliners and two cup holders. Pros/Cons: The sectional features wood frame and coil spring construction, which is good for durability and support. Reviews: Wayfair customers report the quality and comfort are great. Macy's low-profile Nicolo 5-Piece Leather Reclining Sectional Sofa features two power recliner chairs, one power recliner armless chair, one armless chair and one corner unit. You have a choice between cognac and slate colored leather upholstery. The sofa comes with power reclining mechanism. Pros/Cons: 32"H back features adjustable headrests. You may wish to visit the showroom at Macy's to try out the adjustable headrests prior to purchasing. Reviews: Macy's customers like the contemporary look, quality of construction and leather grade. Reclining sofas are a good choice for home media room seating, since they are often more comfortable and adjustable than standard movie theater chairs. A leather finish is durable and prevents stains from drinks and snacks. Look for models with built-in cup holders and fold-down tables. Amazon customers rave about the Homelegance 9636-3 Laurelton. The textured plush microfiber sofa features motion reclining with reclining seats on either end. Available in chocolate brown. Pros/Cons: Customers report that the fabric is easy to clean and remark on how plush and comfortable the sofa is. Reviews: Amazon customers report that the sofa is "super soft and cushiony!" One customer comments that it was slightly difficult to move from the recline position, but still gave it high marks. Wayfair helps you create a media room with a home theater ambiance featuring the FlashFurniture Leather 2-Seat Home Theater Recliner. This double-seater features a storage console. Get a lot of bang for your buck with this modern styled sofa. Pros/Cons: The upholstery is made from bonded leather. You can purchase several sets to create a home theater. The reclining mechanism is a push back model that some customers may find less desirable than lever or power mechanisms. It comes with a manufacturer 2-year warranty. Reviews: Wayfair customer like the easy assembly and that the chairs aren't bulky. Two customers wish the chairs had levers for reclining instead of push back, but still gave rave reviews. There are a few things you should consider before placing an order for your new double reclining sofa. Reclining sofas require more space in front of them than regular sofas, so coffee tables might not fit. Measure where you intend to place the sofa so you purchase the right size for your room. Examine the sofa frame for durability. Hardwood and plywood frames support better than particle board. Test before purchasing. Sit down and don't be afraid to recline and get comfortable. Make sure the reclining mechanism functions smoothly. Check the upholstery seams for quality stitching, especially pillow arms. Ask about a manufacturer's warranty and if furniture store offers a warranty, too. Just like a regular sofa, most double reclining sofas are available either in leather or fabric finishes. It's even possible to purchase slipcovers for selected sofa styles for greater versatility in your room décor. If you take your time and use these tips, you should end up with a great purchase that you and your family will enjoy for years to come.